This is easily my favorite book in the series, short though the series may be. Otherland is a strange story, really – it’s like a hybrid science fiction/fantasy tale in that you can easily forget which genre you’re in. It’s clearly science fiction, in that the whole thing is taking place in a massive computer simulation, but on the other hand, it owes a lot to fantasy – especially the world-crossing aspects of it. Our Otherland heroes have been trapped there for some time now, running through the system with very little understanding of where they are or where they’re going. The whole thing is run by a cabal of the world’s richest men and women in an attempt to foil Death itself, and was built as their eternal playground. Thus, there are countless worlds to choose from. There are places where you can re-live entire historical epochs, where you can fly in rivers of air or play in a cartoon kitchen. You can be a cowboy in the Old West or a Knight of the Round Table or anything that your mind can conceive – and your programmers can work out. Not every virtual god is a good one, of course. The complexity of this system is such that it is indistinguishable from real life. It is multi-sensory, so you get the full experience of actually being there, with none of the obvious CGI cues that we’ve come to expect from the virtual world. What’s more, the owners of the system have nearly godlike power within it. They plan to not only live forever, but have absolute power while doing so. Two of these simworlds – one original, one derivative – are the reasons why this is my favorite book of the series. 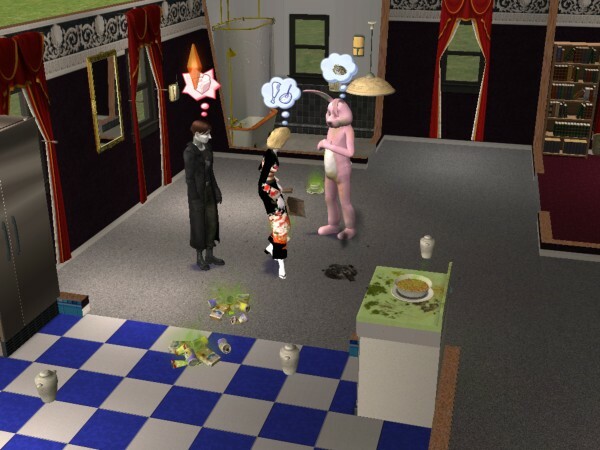 The original simworld (not based on any well-known work or historical event) is the House. After being betrayed by the assassin Dread, who has been masquerading as one of their number, Renie, !Xabbu, Martine, Florimel, T4b and Emily are stuck in a kind of… unfinished world. It’s a place where the programming hasn’t really been settled, and where the unreality of the whole thing can be deadly. They manage to escape by following Dread to a new simulation – a great House that is, in itself, a world. It goes on as far as anyone knows, but is home to countless tribes and nations. Our heroes meet runaway lovers – a cutlery apprentice and a girl from the linen cabinets. They are aided by the Library monks, whose expertise encompasses everything from House history to the minute details of plasterwork. They are nearly killed by attic bandits and hunted by nomadic bands of steeplejacks. 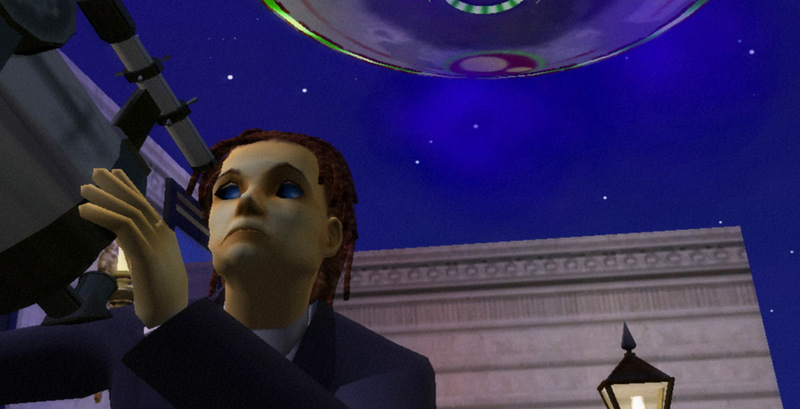 You get them abducted by aliens, of course. 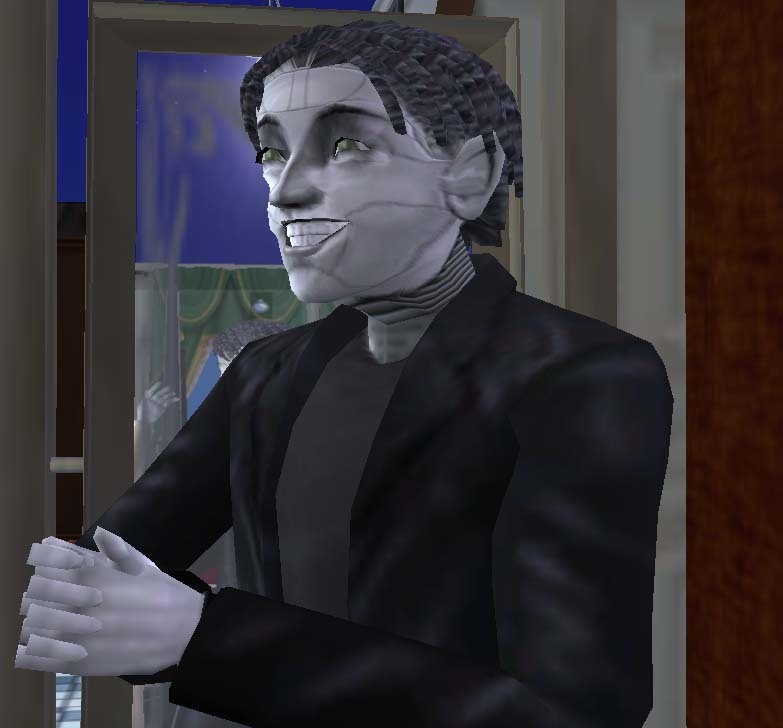 Aside from imbuing the House with a deep sense of history and complexity, Williams raises an important point that anyone who has ever played “The Sims” can recognize: what do you do when you start to empathize with a computer-generated being? During their time in the House, they meet people who seem to be genuinely good, perceptive, interesting people, qualities that we don’t know how to confidently imbue in real humans, much less coded simulacra. The residents of the House have passions and dreams, they love and hate just as “real” people do. They can’t be written off as “just code,” because they don’t act that way. They help and hinder our heroes just as people out in Real Life might. I don't know the answer, but this young... man seems interested in finding out. This brings up an interesting ethical problem: while they can’t be sure what their ultimate goal will be, our heroes are pretty sure that the system will eventually have to be destroyed – as far as they know, it is the Otherland system that is keeping them trapped, and their loved ones in comas. Will doing this be, in essence, genocide? By shutting down the Otherland network to save the children in comas, and to save themselves, will they be condemning thousands – perhaps millions – of coded “people” to extinction? Are these “people” really people? After all, the Grail Brotherhood was planning to become immortal code themselves – would they be any less alive than their meat incarnations? While this is not a problem that we have to grapple with yet, it’s one that may come up eventually. Tad Williams has done a very nice job in this series of predicting technological advancement, so he may have seen forward on this one, too. The other simworld that makes this my favorite book is a derivative one. This means that it is based on an extant work, much like the Alice in Wonderland world that Paul Jonas goes to, or the bizarre cartoon kitchen from which Orlando and Fredericks had to escape. This world is one of the oldest stories there is, and was the first simworld to be created when the construction of the Otherworld began. I’ve read the original poem a few times, and I’m impressed with it every time. It’s a massive story, full of heroes and villains, bravery and treachery, and death. Lots and lots of death. It’s an epic poem, and it deserves the title, as it pits nations, men, and gods against each other in what is ultimately a tragic and terrible ten year war. For Tad Williams to use this as the climax for a novel is nothing short of audacious, but he pulls it off wonderfully. Not only does he manage to keep hold of the terrible horror of war that Homer put throughout his poem, Williams integrates his characters into the story, putting them in the roles of key figures such as Achilles, Patroclus, Cassandra and Odysseus. They all want to get into Troy so they can find their way to the Black Mountain, but to do so they must go through the war that has served as the archetype for human conflict for the last few millennia. Their choices, freely made, reflect the choices of the characters they inhabit, which are themselves models for heroes of fiction throughout literary history. In one wonderful scene, Sam Fredericks, who is inhabiting the character of Patroclus, is wondering what to do about her sick friend, Orlando Gardiner, AKA Achilles. He cannot fight, but the Argives need him, and throughout their long friendship as online gamers, it was always Orlando who was the hero. Sam was the sidekick, the buddy, but when you made the movie poster, Orlando’s character would always be in the middle of the shot. But much like another Sam in another story, Fredericks knows that heroism isn’t just muscles and swords and snappy dialogue. It’s about doing what has to be done, even if you don’t want to do it. Nearly crippled by progeria, a debilitating childhood illness, Orlando has nonetheless continued to fight on in the Otherland. Now the hero cannot fight, and Sam realizes it’s the sidekick who has to pick up the burden. Thus, Sam unknowingly fulfills the destiny of the character she is portraying, puts on the shining armor of Achilles, and goes out to inspire the Argives to fight so that she and her friends might live. Chocolate! It's full of chocolate! The entire Troy sequence is amazing, and every time I read this book, I feel compelled to read The Iliad again. But the series doesn’t end there, of course. Suffice it to say we hit a major climax by the end of this book. People are in danger, secrets are revealed, battles are fought… and one of our brave heroes makes the Ultimate Sacrifice. We are brought to the heart of the operating system, the Black Mountain which entombs the Other. The Grail Brotherhood sets their immortality sequence in motion, and the amoral killer Dread makes his bid for virtual godhood. Setting us up for the final book, we are left with our heroes in disarray – divided and lost, dropped into an entirely new environment that is beyond their understanding and forced to cooperate with their gravest enemies for their survival. You may look at this book and think, “Holy cow. 924 pages. There is no way I’m reading 924 pages.” But you will, and it’ll go a lot faster than you think. Williams has done a great job of making a multi-layered, fast-paced story that you can enjoy on many levels. You can revel in the action and the mystery, you can ponder deep philosophical problems, or you can comb through the great attention to detail and see how much work he must have done to get the Trojan War sequence right. Hats off to you, Tad Williams.